RECEPTION HALL 32' 5" x 18' 0" (9.9m x 5.49m) A stunning room showcasing the wealth of original features including a wide galleried landing with carved "knee joints" and oak panelling to the walls, hand crafted English Oak staircase to the first floor with carved finials and balustrade, oak floor and stunning full height windows to the rear. Doors to principal reception rooms and boot room with quarry tiled floor, sink and unit which in turn leads to the cloakroom with wc and wash basin. DRAWING ROOM 25' 6" x 17' 1" (7.79m x 5.23m) A spacious room with attractive fireplace with glazed display cabinets to either side, large glazed windows to the rear and exposed oak floorboards. DINING ROOM 18' 6" x 16' 6" (5.64m x 5.03m) With feature marble fireplace, oak panelling to walls and exposed Oak floorboards. Double aspect windows to the rear and side. OPEN PLAN SITTING ROOM 25' 6" x 16' 9" (7.79m x 5.13m) With open fireplace, double doors leading to kitchen/breakfast room and doors to central hall and secondary stairs to the first floor. KITCHEN/BREAKFAST ROOM 22' 8" x 14' 9" (6.91m x 4.5m) A charming room fitted with a range of wall and base level units with granite work surfaces, two butler sinks inset and a fireplace housing gas fired AGA. UTILITY ROOM With a range of fitted units, plumbing for washing machine, dishwasher and tumble drier, space for fridge/freezer, wine cooler and cooker point. FAMILY ROOM 14' 11" x 12' 11" (4.57m x 3.96m) With window to the rear aspect. GALLERIED LANDING Featuring unique decorative carvings and overlooking the reception hall. With doors to the principal first floor rooms. DRESSING ROOM 15' 8" x 14' 11" (4.8m x 4.57m) With windows to the front and rear aspect and doors to En-Suite comprising bath, tiled shower cubicle, twin hand wash basins, low level WC and bidet. BEDROOM 3 20' 6" x 16' 9" (6.25m x 5.13m) A charming room with large bay window to the rear aspect, fireplace, parquet flooring and door to En-Suite comprising panel bath, wash hand basin, fully tiled shower cubicle and low level WC. BEDROOM 4 16' 6" x 14' 0" (5.05m x 4.27m) With bay window to the front aspect and door to En-Suite comprising panel bath, wash hand basin, low level WC, windows to the front aspect. BEDROOM 5 17' 8" x 15' 3" (5.41m x 4.65m) With exposed ceiling timbers and door to dressing room/store room. BEDROOM 6 14' 6" x 14' 2" (4.42m x 4.34m) With vaulted ceiling and door to external spiral staircase to the ground level. BEDROOM 7 16' 2" x 11' 1" (4.95m x 3.4m) With vaulted ceiling. SHOWER ROOM With shower cubicle, wash hand basin, bidet and low level WC, part tiled walls. CELLARS Below the main staircase a door leads down to three store rooms, one of which is fully shelved, in addition to a wine store and a silver room. This offers excellent potential for further living accommodation which could have a variety of uses such as a gym, cinema room or an office. 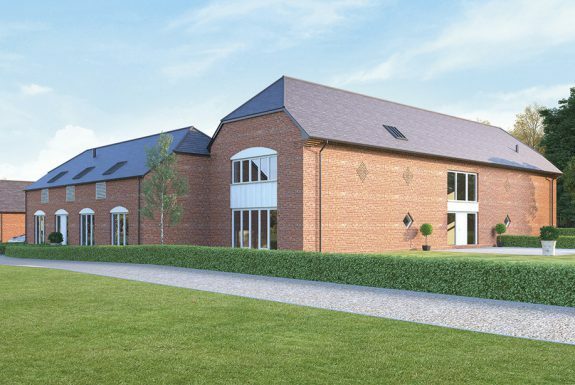 OUTSIDE The property is approached by a sweeping carriage driveway featuring a delightful central water feature, in turn leading to the substantial garage block with three large garages and cart lodge with light and power connected. 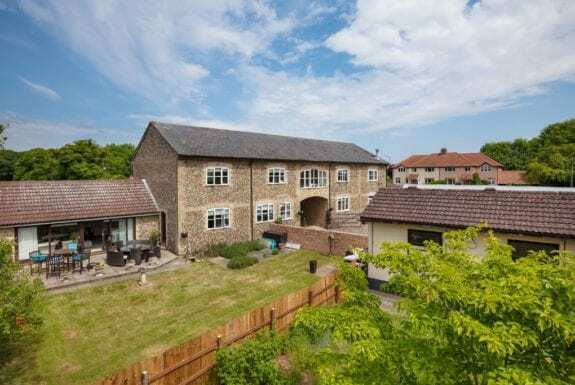 The beautiful mature grounds offer a high degree of privacy and are enclosed by boarded wooden fencing and a brick wall to the front and side. The attractive gardens have been well maintained with lawns, mature specimen trees including cedar, copper beach and limes, well stocked flower and shrub beds, large paved terrace and outside lighting. In all about 1.2 acre.